The SStS Panama course begins in the bustling metropolis of Panama City, home to one of the world’s engineering marvels, the Panama Canal. The first two days will be spent exploring this vibrant multicultural city, including visiting the canal and the colonial neighborhood of Casco Viejo. After experiencing Panama City, the group will take a short flight to the beautiful Bocas del Toro province, an archipelago off the northwest coast of Panama and home to our non-profit partner, Give and Surf. While Panama ranks higher than most Central American countries in key education indicators, the indigenous Ngobe communities in the Bocas del Toro islands face a very different reality. Give and Surf works directly with these remote communities in order both to protect their culture and to ensure future opportunities for employment through education and community development. 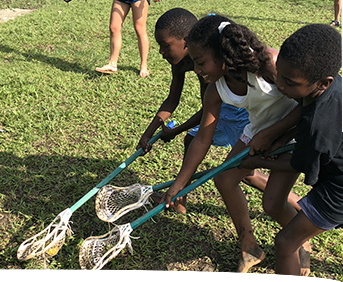 While in Bocas del Toro, the group will be working in the community centers run by Give and Surf that support English language instruction and other activities run by local leaders in three different villages. Through this project work, student will have the chance to learn about the diverse and unique cultures that exist in the communities served by Give and Surf. In addition to teaching, the group will help to maintain several local schools through painting and other beautification projects. 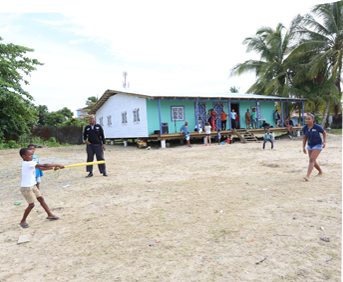 They will also have the chance to interact with younger students while visiting the pre-kindergarten programs run by Give and Surf. Additionally, while in Bocas del Toro, the group will learn from local leaders, hike to remote beaches, visit a chocolate farm, and snorkel in the stunning Zapatilla Islands. In this striking setting, students will have the chance to reflect on what they have learned about compassion, an inclusive perspective, and ethical leadership. Give and Surf’s mission is to empower the communities of Bocas del Toro through education and community development. To learn more, please visit their website. SStS students will spend time creating and delivering lessons and enrichment activities at local community centers run by Give and Surf. Because a majority of the course occurs on an island with no cars, the students will primarily walk or take boats to local sites. The group will also have the opportunity to explore various sites on the island on a couple of long day hikes. While at the project site, students will live in simple dorm rooms at the Hotel Caribbean View, a hostel that is in one of the communities served by Give and Surf. While in Panama City, they will also stay in a hostel. After arriving in Panama City, the group will take a short flight to the islands of Bocas del Toro. From there they will take a quick boat ride to the island of Bastimentos where they will be based. Finally, they will return by plane to Panama City on the final day of the course. Students will spend two weeks at a hostel on the island of Bastimentos. Although students do not stay with individual families, opportunities exist each day to interact with the children at the community center, local families, and local Panamanians staff. The group will spend a majority of their time on Bastimentos Island, a small island without cars, that is a 10-minute boat ride from the main town of Bocas del Toro. The most important thing I learned was that being from a different country or speaking a different language does not mean two people can’t connect and work together towards a common goal. Depart from Miami, begin group orientation in Panama City. Full day tour of the city including the Panama Canal & Museum, Casco Viejo, and Amador Causeway. Fly to Bocas del Toro, learn about Give and Surf, plan for the upcoming week. Teaching, supporting enrichment activities, and beautifying local community centers with time for beach hikes, lesson planning, and meeting local leaders. Field or beach trip with Escuelita (Pre-Kindergarten program), visit to Bahia Roja & Bahia Honda, lunch and tour at La Loma Chocolate Farm.